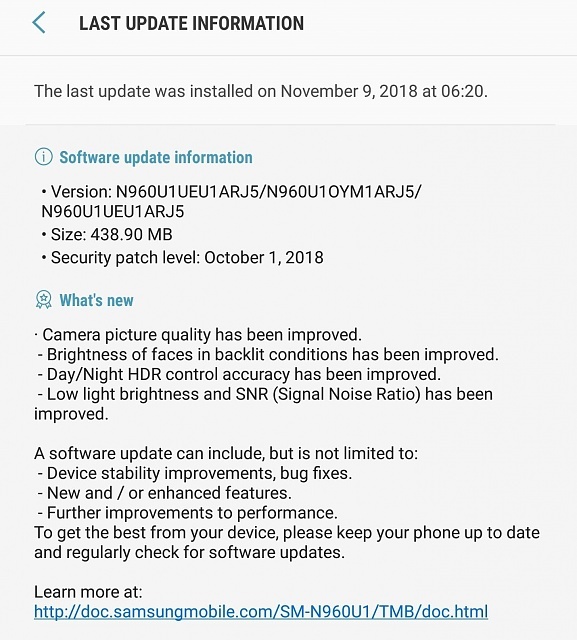 As reported for other carriers, ARJ5 is 438.90 MB, has the Oct. 1 security patch level, and lists various camera improvements (but not a fix for the camera-freeze problem). Camera version is now 8.5.05.25. The ARJ5 update is not yet documented on T-Mobile's Note9 support page. I have the SM-960U1 model (US unlocked), but the update is presumably available for the carrier-branded model too. Not seeing it on mine yet. my unlocked received it last night. I downloaded this morning. Unlocked Note 9 on Tmobile. Finally! Thanks for the info. Downloading now. Are you guys who are receiving all on unlocked devices? Just using the T-Mobile network? If so, wouldnt that mean that its just rolling out to the unlocked devices now, irrespective of carrier? Not actual T-Mobile Note 9s. I'm on a T-Mobile Note 9 and got nothing. You'd be correct, everyone I've seen get it on T-Mobile has been unlocked. Didn't T-Mobile used to be good at timely updates? Now it seems they're almost last. Didn't T-Mobile [use] to be good at timely updates? Now it seems they're almost last. As I understand it, even the unlocked phones get their updates from whichever carrier they're using. T-Mobile unlocked Note9s just got the ARJ5 update today, but some unlocked Note9s on other carriers got their ARJ5 updates a week or two ago. I don't know why the T-Mobile branded Note9s are lagging behind the T-Mobile unlocked Note9s, but I'd expect them all to update very soon too. I have not received an update! I've just downloaded it and am installing it now to my unlocked Note 9. I am on Sprint. This thread is specific to T-mobile. So far, it sounds like unlocked on T-mobile is get tong the update and T-mobile branded not getting the update yet. i thought everyone was saying unlocked are slow to get updates.. that doesn't seem to be the case anymore? I checked this morning and I have an update ARJ8? But it has the same October security date as ARJ5? I checked this morning and I have an update ARJ8? But it has the same October security date as ARJ5? It's not unusual for multiple firmware versions to share the same security date, even for the same phone model. In this case, it's possible that the unlocked T-Mobile Note9s (N960U1) are getting ARJ5 while the branded ones (N960U) are getting ARJ8, but the two updates may have the same changes. I finally got mine as well. No mention of camera updates. But, I'm assuming it's included due to the size. However, Samsung's website is not showing camera updates, either. 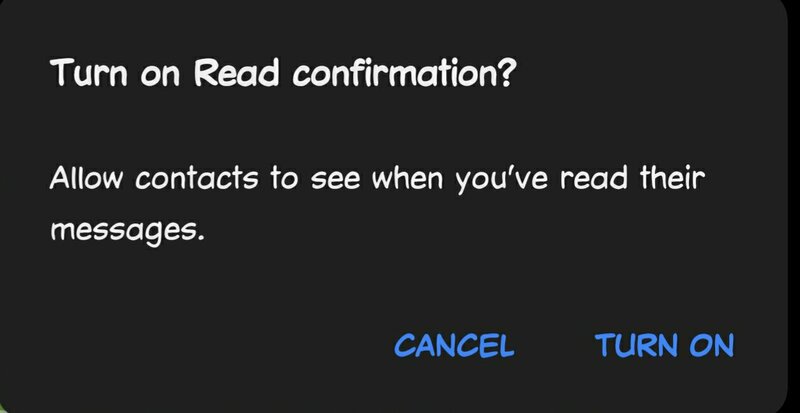 Is everyone getting this annoying pop-up every time you enter a different message conversation? I've never seen noticed this before on any other updates. I got the RCS update on my S8 a few weeks ago. That phone is not giving me these pop-ups. Once you select cancel for each thread, it doesn't show again. But, it's still annoying. So I just did this update a little bit ago. For those who have done it and had it for a while are you seeing any improvements with anything? Thanks. I just came back from a 2 week vacation and was so very disappointed with the camera. It is very lacking and I miss my Note 5! Why did my app notifications stop working after the recent update on my Galaxy Note 9? Will there be an android oreo update for moto E4? Can I use public wifi to do a software update?